Life in Utah, produced by the Salt Lake Chamber, is a comprehensive relocation and tourism guide to the great Beehive State. This annual magazine addresses everything that makes Utah a great state to live, work, play and do business. As a guidebook for the Wasatch Front and the state of Utah, Life in Utah will be used extensively by businesses, residents, newcomers and visitors. This beautiful, high-gloss magazine is full of informative content on tourism, business, communities, education, finance, healthcare, arts, entertainment, transportation and more. Life in Utah is an invaluable resource for businesses in Utah, and a powerful vehicle to promote your organization. 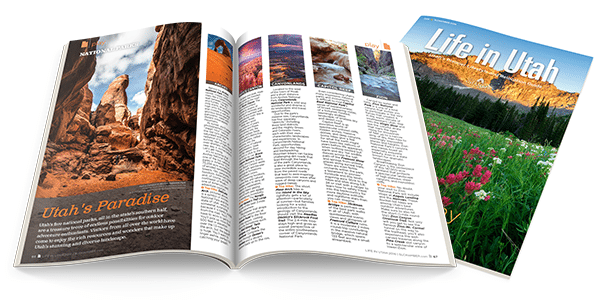 Life in Utah is distributed free throughout the calendar year by the Salt Lake Chamber to hundreds of area businesses, real estate professionals, hotels, government agencies and retail locations throughout the state, making it easily accessible for readers.